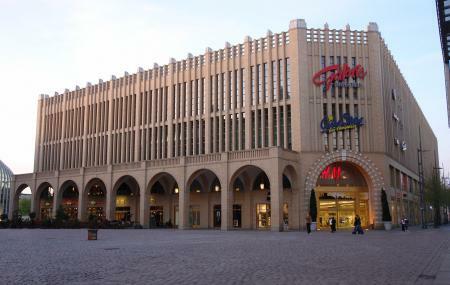 Galerie Roter Turm is a shopping mall in the town of Chemnitz in Germany. Home to many shops and restaurants, a few of the shops and stores located in this mall are clothings, bookstores, electronics, pharmacies, flower shops, hairdressers, gastronomy and food, gifts and living, hobby shops, perfumes, shoes, jewellery. A favourite place to hang out among the local crowd, a visit to the mall is a must for every visitor. With many cafes, restaurants and other entertainment options, Galerie Roter Turm is open between 09:30 AM and 08:00 PM. There is plenty of parking available in and around the mall premises. How popular is Galerie Roter Turm? People normally club together Jakobikirche and Das Chemnitzer Rathaus while planning their visit to Galerie Roter Turm. Nice shopping area in the city centre right beside the Roter Trum . Small shopping mall in city center. Its okay for buying basic stuff but not for extensive shopping. Can get food and ice-cream here. An electronics store and barber shop are there as well. Cinema at top floor.